Every state in the US produces wine. Why not taste them? 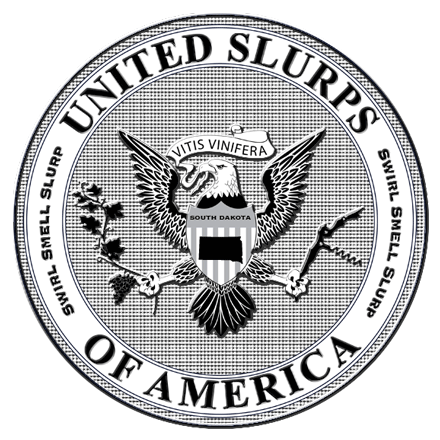 We’re doing just that…welcome to the United Slurps of America. The next stop on Our tasting tour: South Dakota. What’s in a number? We feel compelled immediately to apologize to our tasting partner, Rachel of the delightful food blog, Tramplingrose, and to the kind folks at Prairie Berry Winery. The 13th state in our Slurpin’ USA tasting trip took about 13 weeks to get published. We don’t consider ourselves superstitious people, but geez-la-weez, it’s been a doozy getting this post up. The summer months have been cruel for the blog (oh malware, how we despise you). I then contacted Prairie Berry, out in Hill City. Within 2 days, I received an email from the very nice Michele, as well an email from Karen, as well as 2 phone calls regarding their willingness to not only ship me 4 bottles of wine to try, but they would send the same to Sacha. South Dakota has goofy-assed laws about alcohol shipments, meaning while Prairie Berry had no trouble sending wine to California, they couldn’t ship it to me, an 8-hour drive across the same state. So they worked with the local liquor store, and had a box sent to me, care of Brookings Municipal Liquor Store. In no time the wine arrived in Hollywood and Brookings. Rachel took the opportunity to do what she loves: cook a great meal, and have some friends over (an impulse We fully endorse). I know virtually NOTHING about the proper way of tasting wine, although I know a little. Hal [an invited guest] asked me if I was planning on having spit buckets placed around my living room, but I told him that even though the booze was free, we were NOT wasting it, so no spitting (and he didn’t end up coming over anyway, so it didn’t matter). She said: The color is a rather unattractive orangey beige like a 1960′s monochromatic living room. On the nose: petrol, pine needles, burnt oak–similar to some intense Rieslings. Syrupy in texture, with pleasant flavors of peaches, apricots, and honey initially on the palate, but the wine hollows out and finishes with chemical-like notes. Strange and out of balance. Lacks acid and finesse. He said: Looks like a German beer. Peach, apricot and honey on the nose… and it looks like honey in the glass; a German beer with honey. Too woody in the finish. It’s way too light in the mouth, totally lacking acid. The 3rd sip tastes better than the first, but that uncomfortable aftertaste kills it for me. Tramplingrose said: This, I liked. A lot. I don’t usually care for white wines, as I find a lot of them too sweet (but that could just be that I’ve never had a good white wine). It was rather rosy-gold colored, kind of like Black Hills Gold (and we all wondered if that was done on purpose, since that’s where Prairie Berry is located). Jay and Melissa both also agreed that the color was a little off-putting, and both thought it looked more like a cognac or brandy (my thought was scotch). This actually smelled like wine–Crisp, and clean. I thought the taste was fruity, but slightly acidic. I don’t remember much of an aftertaste. She said: In color it is a pretty, bright, translucent red, like Oceanspray Cranberry Juice Cocktail. Smells sweet and tart, like a Jolly Rancher or fruity Sno-Cone. Immediately thought it would be great on the rocks with a splash of vodka or sparkling wine. In the mouth there is no hint of alcohol and a very dry finish. Refreshing, quenching, and with its bright, cheery color, very festive. He said: Weird nose… I guess this is what rhubarb smells like, I haven’t had it since I was a kid. Whoa, it’s good. Like real good. It tastes like the tri-colored sno-cone you get from an ice cream truck when it’s melted and all of the three colorflavors have mixed together, coconut and strawberry and a third mystery colorflavor. This would be a great mixer. This is strange and/but wonderful. Tramplingrose said: This seems like more of a novelty wine than anything else…Kind of like the Klingon Blood Wine that’s permanently holding a spot on my wine rack because I refuse to open it. Or one of those wines that people who grow up in South Dakota then move away buy whenever they return home for a visit. According to the label, it’s 90% rhubarb & 10% raspberry. I should also qualify this by saying that I’m a weirdo who has never had rhubarb before in my life. No strawberry-rhubarb pie, no rhubarb cake, nada. So I might not have the best frame of reference here. After I first sniffed it, I commented that it smelled like a Bath & Body Works lotion–Very fruity and floral. My first sip was slightly medicinal and coconutty. After that, sadly, it was downhill. Jay thought it looked like Kool-Aid, and thought it tasted like an instant wine (if such a thing existed). Melissa did not like it at all, and the more I drank, the less I liked it. For a semi-sweet wine, it was more sour than anything. Out of the 3 wines we tasted that night, this was the least popular. She said: Deep cranberry juice in color. Smells like what it is: currants and with a hint of green bell peppers. Bursting with fruit in the mouth, and because We served it chilled immediately brought to mind black currant sorbet. Simple and sweet, but not cloying or syrupy. Very cassis-like with a touch of white pepper and a pleasant tartness in the finish. Tastes like the perfect kir. Later friends came over and We made a spritzer by pouring the wine over ice and adding splash of soda water. We all agreed it was a delicious and festive concoction. He said: Smells like a sweet cabernet with, umm, a lot of black currant. Feels like cranberry juice in the mouth– juicy but dries your mouth. It’s really refreshing. Can We mix some vodka with this, a South Dakotan Cape Codder? No hint of alcohol even though it’s 12%. I want a bunch of this and the rhubarb for next summer. 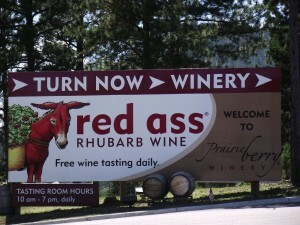 Tramplingrose said: I should point out that I am a huge cornball, so the name of the wine and the label cracked me up. It’s a black currant wine, and fairly sweet. It looked, smelled and tasted basically like cranberry juice to myself, Melissa, and Jay (I forgot to get Jen’s thoughts on it, and Jessica wasn’t drinking because she’s expecting). I did think something about it smelled like the produce section of the grocery store–Very green; Jay described it as leafy-smelling. It went down easy, and was very berry-centric. Overall, we liked it. 13 down, 37 to go. We said: Remember when We thought We would taste a state a week? Ha! Life has gotten busy for both of Us, but We are still committed to our initial goal of tasting wine from every state– it’s just going to take a little bit longer. But it’s worth it. We would never have tasted so many wines and would not have known that rhubarb wine even existed. Thanks to Tramplingrose for taking the reins on this one and making it happen. And thanks to Prairie Berry for the wine. We really enjoyed it. Cheers. 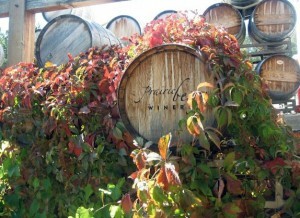 Tramplingrose said: Prairie Berry has been making wine in South Dakota since 1876. According to the pamphlet that came with the wine samples, the winery was started by Anna Voltja, a Moravian immigrant, who made wine from the “prairie berries” she found. They still focus on using native South Dakota ingredients. While I have yet to visit the Black Hills, the area looks beautiful, and when I make it out there, I am going to make a point of visiting the winery, just because the ladies with whom I spoke and emailed were so nice and helpful. Thank you again for letting me be part of this–I had a lot of fun with it! Interesting Blog. Do you ever taste international wines i.e. South African wines….always looking for wine blogs. Lot’s of fun, Rachel. Thanks for all your hard work–and patience. Great Blog.. I just found you ( I know.. late to the game ). If you’re looking for help with Oregon wines, let me know and I’d be happy to help you find your way through the maze. My good friend Tamara has a wine blog that had a similar objective.. taste all Oregon Wineries in one year ( I think there’s about 365 or so ).. she didn’t quite make it and isn’t rushing anymore, but she’s a great writer and a good resource for you.